Our founders standing from left to right: Attorneys Michael Angelo Pontrelli, August "Gene" Carloni, Paul Caruso, Eugene Damiano, and Carl "Tony" Capozzola. Seated: Los Angeles Superior Court Judge Mario Clinco. 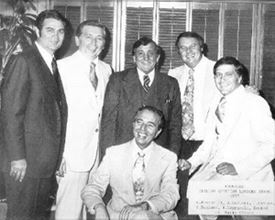 Early in 1977, the five lawyers and one judge pictured above set out to establish an organization of Italian American lawyers. Funded with a generous donation from Frank Sinatra himself after a long night of lobbying by Founder Carl A. "Tony" Capozzola that included many hands of blackjack and shots of Jack Daniel's at Caesars Palace, a Political Action Committee was formed and the group set about turning plans into action. A directory of lawyers' telephone numbers was scanned for Italian-sounding names, and a spate of presumed Italians in Los Angeles and Orange counties received a letter inviting them to an organizational meeting on April 17, 1977 at the Beverly Hills home of Paul Caruso. Between 40 and 50 lawyers attended that meeting. The IALA was born. On July 20, 1977, the first "regular" meeting of the association was held at Casa Italiana, located north of Chinatown, which remains the site of the monthly gatherings. Caruso was drafted as the "interim" president. Despite the limited title conferred at the time, he is regarded as the organization's first president. A nominating committee, chaired by Robert Mallano, was charged with selecting persons to serve as officers for the full year of 1978. Mallano was never to serve, himself, as an officer of the organization. He was the first member of it to be appointed to the bench, largely through the IALA's efforts. He became a Superior Court judge, again at the urging of the IALA, and served as the court's presiding judge in 1993 and 1994. Mallano was subsequently elevated to the Court of Appeal, and has credited the IALA as being largely responsible for his elevation. Caruso and Mallano are but two of the organization's luminaries, two players over the past two decades who have brought credit to an organization marked by achievement, while known for its camaraderie and fun. From our first President (Paul Caruso in 1977) to our immediate Past-President (R. David Di Julio), each President has put a unique stamp on our organization and contributed to our history and achievements. Ernani J. D'Angelo, M.D., J.D.